Despite growing speculation of a global economic crisis in 2020 and mounting challenges facing African nations, the International Monetary Fund and the African Development Bank (AfDB) both predict overall growth in Africa will improve in 2019 and 2020. In the 2019 African Economic Outlook, published by AfDB, outlines the fastest-growing economies across the continent and highlights the biggest challenges they’ll face over the coming years. East Africa remains the fastest-growing region in Africa – and one of the fastest in the world – with five of the continent’s 10 fastest-growing economies being in the eastern region. Based on IMF growth predictions for 2019, Libya will be the fastest-growing African economy this year with a predicted GDP of 10.8%. Ethiopia and Rwanda round up the top three with 8.5% and 7.8% respectively with Tanzania, Uganda and Kenya being the other East African economies in the top 10. According to AfDB’s GDP data, East Africa remains the fastest-growing region in the continent and this will continue into 2019 and 2020. 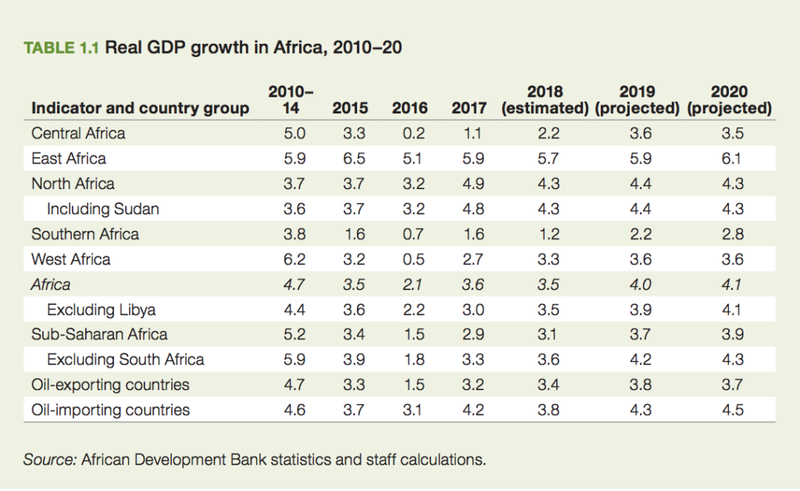 The AfDB’s 2019 African Economic Outlook says that, while North Africa leads in terms of growth recovery, East Africa is still the most dynamic region in the continent. “East Africa, the fastest growing region, is projected to achieve growth of 5.9 percent in 2019 and 6.1 percent in 2020 (table 1.2). Between 2010 and 2018, growth averaged almost 6 percent, with Djibouti, Ethiopia, Rwanda, and Tanzania recording above-average rates,” the report says. However, AfDB warns that weak performance in Burundi and South Sudan are bringing down the regional averages. While the overall projections for African economies is positive, there are various factors that need to be tackled for projected growth to be achievable. One of the biggest challenges for African nations will be creating enough jobs for their rapidly growing populations. Africa’s working-age population is set to grow from 705 million in 2018 to 1 billion by 2030 and ensuring there are enough jobs for them is going to be difficult. While technology is promising to drive growth across the continent, there’s a danger it will also take jobs away from people, meaning Africa needs to find the right balance between maximising efficiency and creating job opportunities. Employment isn’t the only factor impacted by Africa’s population growth, either. It’s going to add pressure on public services such as education and healthcare – both of which are important when it comes to providing people with work skills, as well as keeping them fit and healthy. As the AfDB points out in its report, African nations are going to have to work together to overcome these problems – starting with improving intra-African trade, opening up borders for business travel and boosting relations. A more integrated Africa will be a more sustainable one that’s better prepared to tackle home-grown issues and build stronger economies together.